Founded in 1964 as a "National School of Engineering" Offenburg University of Applied Sciences quickly established itself as a high-performance educational institution with a practical orientation. Today our University forms a thriving community, with more than 4,500 students on two campuses. We offer Bachelor's and Master's degrees in these four departments: Business and Industrial Engineering, Electrical Engineering and Information Technology, Mechanical and Process Engineering, and Media and Information. The University maintains excellent relations with regional and national businesses, and there is a constant exchange of information between faculty members and industry professionals, providing continuing access to current scientific and engineering know-how. These extensive business partnerships also provide resources for students in terms of gaining work experience, doing research, or for future employment. 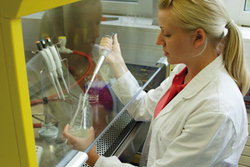 The Institute for Applied Research (IAF) heads the University's technology and innovation work in the fields of solar energy, medicine, robotics and electric mobility, among others.The close collaboration with industry partners benefits all sides – application-oriented research and technology transfer, up-to-date laboratories and concentrated, interdisciplinary expertise in different technological fields all provide major draws for prospective students. Offenburg University prides itself on the international orientation of its programs. In 1998, it was one of the first institutions of higher education in Germany to introduce international Master's degree programs through the Graduate School. Today, we offer five English-taught programs which cater especially to international students, who comprise about twelve percent of the total student body. Additionally, the International Office maintains active exchange programs with more than 70 partner universities worldwide, giving our students plenty of opportunities to study and pursue internships abroad. Thanks to our proximity with the French border, we can also offer double-degree programs with prestigious French universities. Students at Offenburg University benefit from the advantages of a more intimate campus environment - smaller classes, individual supervision and support by faculty and staff, hands-on teaching, and close integration with the regional economy. It enjoys consistently high rankings and as a reformed technical college has been awarded by the Association for the Promotion of Science and Humanities in Germany. Fifty years of innovation culture: Offenburg University!